NOTE: Written with the assistance of Stuart Wheeler. Forward by Jackie Stewart. COVER: Backgammon is a game of flair, psychology, nerve, self-discipline and stamina, and it has suddenly taken off as one of the world's most popular table games. If any one factor is responsible for this revival of international interest it is doublinga procedure which can lead to a rapid escalation in the stakes, and an innovation which has added a whole new dimension to the excitement of a game which was already a good one. As with bridge, stakes vary greatly, depending on the company, but the incentive to win is always greater when there is money at risk. Understandably, therefore, there is an increasing need for up to date information on a game in which strategies and techniques of play have rapidly become significantly more sophisticated. This book, written by Phillip Martyn, Britain's best known player and a full time professional, will fill that gap for years to come. The author's approach is both straightforward and prctical and his book takes the reader impressively through all stages of the game. Moreover he gives the clearest advice yet on the all important question of when and when not to double. 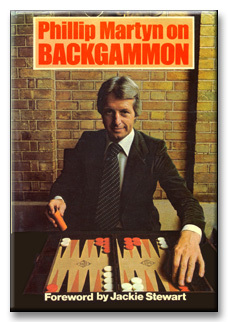 It is a common misconception that backgammon is a highly mathematical game and that if you had a big enough computer it could tell you every move to make. But there are many situations where an understanding of mathematical probabilities will give the player an advantage and here again Phillip Martyn gives expert guidance. There are also chapters on chouettesbackgammon can equally well be played by more than two peopletournament play and even running a tournament, as well as an invaluable glossary of backgammon terms. Fundamental instructions and ideas are covered for the player with little or no knowledge, before the book progresses to topics that will be of fascination to players at the most advanced level. Throughout, Phillip Martyn admirably succeeds in impressing upon the player the need for thinking out the problems and tactics that make for intelligent play. Like members of the World Professional Tennis Circuit, leading backgammon players fly from country to country and capital to capital, competing against all-comers for staggering sums of money. Phillip Martyn has maintained a top position in this glamorous but ruthless chool for many years. Also a tournament organizer and a widely experienced teacher of the game, his qualifications for writing an instructional book on backgammon are unrivalled.